In June 2009 We cleared out a storage cupboard in our studio complex, with the intention of turning it into a new server room for the 24 hour project as it neared completion. 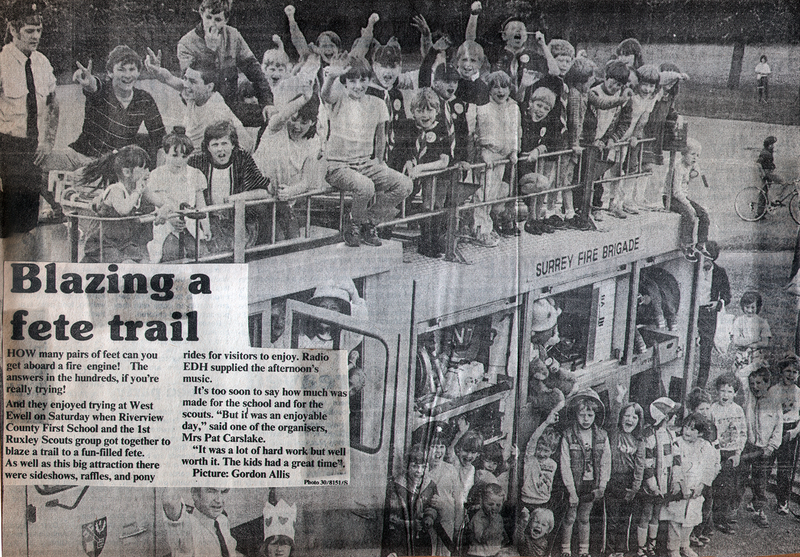 During the the clear out, we discovered a folder of old press cuttings, mostly from about 1980 to 1985. 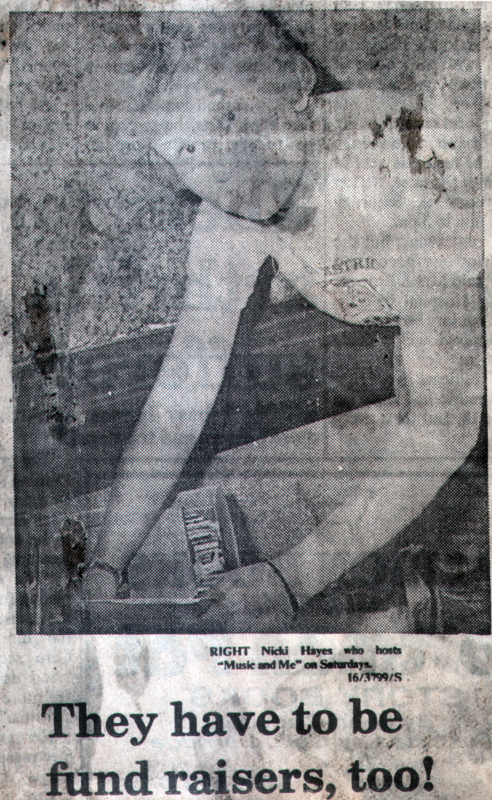 The press cuttings looked to be in a sorry state, so the decision was taken to scan them to preserve them digitally forever. Having scanned them and lifted all of the text from the pages, is wasn't much more effort to put them on the website. Tucked away in the grounds of Epsom District hospital is a music station that's gone from strength to strength. Members work as a close knit team, putting in long hours with ward visiting, fund-raising - and, some, presenting programmes. Station controller, Nigel Ansell, whose wife Lesley is also a member of Radio EDH, understands how lonely and worrying a hospital stay can be. "We like patients to think of the station as their constant friend and companion," said 29 year old Nigel. "Keeping them in touch with all that's going on in the community." "At one time or another, nearly all of us have been a patient." The message is clear - they aim for the personal touch. A dedication can lift a patient's spirits. They never know when they might hear their name on the air. Nigel says they model their style on Radio 2, with a general music programme. "Someone may be admitted on the Monday and gone by the end of the week, so we go for the general appeal." Their record collection includes 200 albums and around 500 singles, with a scattering of old 78's. Most presenters also bring in their own. 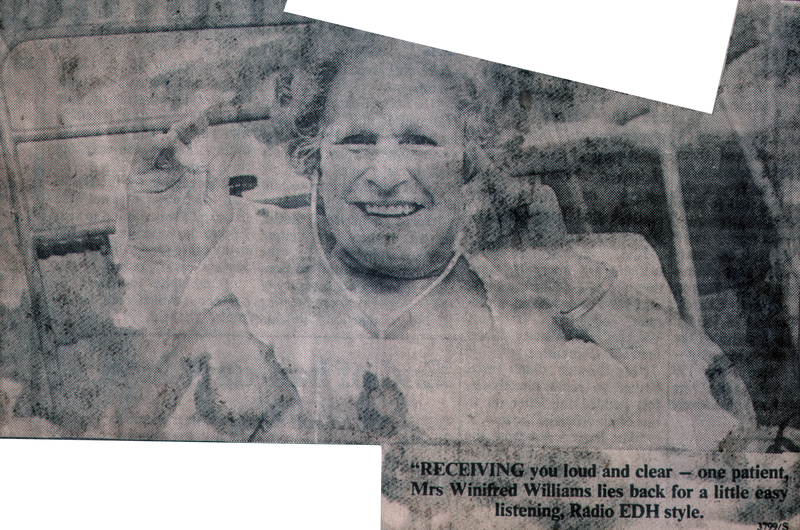 Ansell plays music and includes a selecltion of children's jokes and listeners' letters. "Friday Favourites" includes favourites from the last 30 years, while "Current to Classics" features light orchestral music and the more mellow modern sounds. Aside from music, "Here, There and Everywhere" also looks at the mid-week sport, and "Christian Reflections" has a guest-of-the-week, thoughts, hymns and prayer. But if you only want to present a show forget it. There's much more to it than that. "The priorities are to serve the patients then the community stressed Nigel. Ward visiting and fundraising take up a lot of time and presenting the programme is really the 'icing on the cake." In fact, anyone who joins the team is on three months probation. Such is the concern to keep up standards. Trainind sessions are slotted in either early in the morning or late at night. Broadcasting hours are 8pm-10 pm Monday to Friday, and 12 noon-8 pm Saturday and Sunday. So it's the only way. What sort of people would they like to join the team? "People with a sense of community spirit," said Nigel, thoughtfully. There's no room for people who want to be DJ's and nothing else. "They should be atleast 18 and prepared to make a commitment. "We ask them how many hours they're prepared to devote to the station, and about their hobbies and experience." 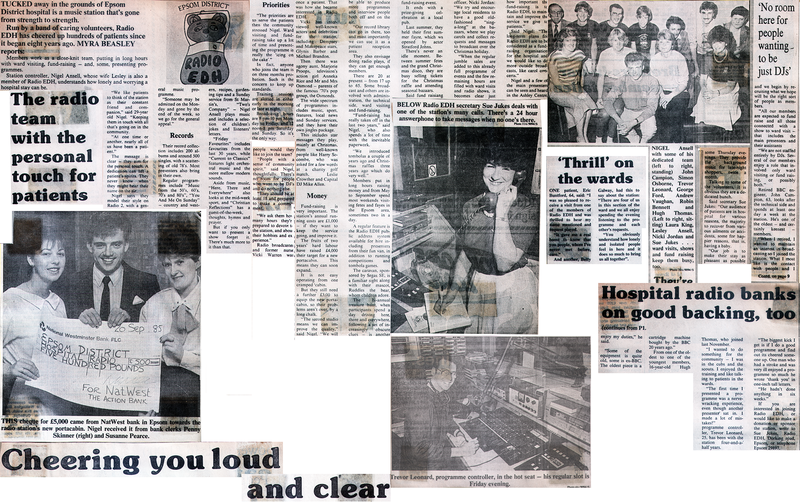 Radio broadcaster and former nurse, Vicky Warren was once a patient. That was how she became interested in Radio EDH. Vicki has interviewed well-known actors and celebrities for the station, including Dempsey and Makepeace stars, Glynis Barber and Michael Brandon. Then there was agony aunt, Marjorie Proops, television's action girl Anneka Rice and Mr and Mrs Osmond - parents of the famous '70s pop group, the Osmonds. The wide spectrum of programmes includes music, sport, features, local news and Sunday services, and they have their own jingles package. This includes star messages they play, mainly at Christmas, from well-known people like Harry Secombe, who was asked for a few words at a charity golf match, Leslie Crowther and Capital DJ Mike Allen. Fund-raising is very important. The station's annual running costs are £1,000 - if they want to keep the service going and improve it. The fruits of two years hard labour have raised £4,000 their target for a new portacabin. This means they can soon expand. It is not easy operating from one cramped cabin. But they still need a further £300 to equip the new portacabin, so their problems aren't over, by a long chalk. "Our record library can go in there, too and most importantly we can use it as a patient reception area. They also envisage doing radio plays, if they can get enough members. There are 20 at present - from 17 up to 65. Some broadcast and others are involved with administration, the technical side, ward visiting and fund-raising. "Fund-raising has really taken off in the last two years," said Nigel, who also spends a lot of time with the inevitable paperwork. "We introduced tombolas a couple of years ago and Christmas raffles three years ago which do very well." Members put in long hours raising money and from May to September spend most weekends visiting fetes and fayes in the Epsom area, sometimes two in a day. A regular feature is the Radio EDH public address system available for hire including presenters from their fun van, in addition to running competitions and tombola games. The caravan, sponsored by Segas SE, is a familiar sight along with their mascot, Ruddles the bear, whom children adore. The bi-annual treasure hunt, when participants spend a day driving here, there and everywhere, following a set of increasingly obscure clues - is another fundraising event. It ends with a prize-giving celebration at a local pub. Last summer, they held their first summer fayre, which was opened by actor Stratford Johns. There's never an idle moment. Between summer fetes and the grand Christmas disco, they are busy selling tickets for the Christmas raffle and attending seasonal bazaars. Said fund-raising officer, Nicki Jordan: "We try and encourage local residents to have a good old-fashioned "sing-a-long" at the bazaars, where we play carols and collect requests and messages to broadcast over the Christmas holiday. "When the regular jumble sales are added to this already full programme of events and the few remaining hours are filled with ward visits and radio shows, it becomes clear just how important the fund-raising is to Radio EDH, to maintain and improve the service we give patients." Said Nigel: "The long-term plans for Radio EDH are to be considered as a fund-raising organisation to the hospital and we would like to do more outside broadcasts, like carol concerts." Nigel and a few of the main presenters can be seen and heard in the Ashley Centre some Thursday evenings. They provide the background music for late-night shoppers, twice a month. Talking to some of the volunteers, it is obvious they arc a dedicated bunch. Said secretary Sue Jukes: "Our audience of patients are in hospital for various reasons, the majority to recover from various ailments or accidents, some for happier reasons, that be having a baby. "Our job is make their stay as pleasant as possible and we begin by recruiting what we hope will be the right sort of people as members. "All Our members are expected to fund raise and all those connected with a show to ward visit that includes the main presenters and their assistants. "We are not staffed entirely by DJs. Several of our members enjoy a role that involved only ward visiting or fund raising, or possibly both." Retired BBC engineer, John Campion, 63, looks after the technical side and spends at least one day a week at the station. He's one of the oldest - and certainly keenest members. "When I retired, I wanted to maintain an interest in broadcasting so I joined the station. What I most like is the contact people and I enjoy my duties," he said. Hospital radio banks on good backing, too "Some of the equipment is quite old, some is ex-BBC. The oldest piece is a cartridge machine bought by the BBC 20 years ago." From one of the oldest to one of the youngest members, 16-year-old Hugh Thomas, who joined last November. "I wanted to do something for the community - I was in the cubs and the scouts, I enjoyed the training and like talking to patients in the wards." "The first time I presented a programme was a nervewracking experience, even though another presenter sat in. I made a lot of mistakes!" Programme controller, Trevor Leonard, 25, has been with the station four-and-a-half years. "The biggest kick I get is if I do a good programme and find out its cheered someone up. One man who had a stroke and was very ill enjoyed a programme so much he wrote 'thank you' in one-inch tall letters." "He hadn't done anything in six weeks." If you are interested in joining Radio EDH, or would like to make a donation or sponsor the station write to Sue Jukes, Radio EDH, Dorking Road, Epsom, or telephone Epsom 29879. One patient, Eric Buntford, 64, said: "I was so pleased to receive a visit from one of the members of Radio EDH and was thrilled to hear my name mentioned and request played. "It gives a real boost to know that you people, whom I've never met before, care." And another, Betty Galway, had this to say about the station: "There are four of us in this section of the ward and we all enjoy spending the evening listening to the programme and each other's requests." "You obviously understand how lonely and isolated people feel in here and it does so much to bring us all together". Nigel Ansell with some of his dedicated team (left to right, standing) John Campion, Simon Osborne, Trevor Leonard, George Ford, Andrew Vaughan, Robin Bennett and Hugh Thomas. (Left to right, sitting) Laura King, Lesley Ansell, Nicki Jordan and Sue Jukes... ward visits, shows and fund raising keep them busy, too. Below Radio EDH secretary Sue Jukes deals with one of the stations many calls. There's a 24 hour answerphone to take messages when no one's there. This cheque for £5,000 came from NatWest bank in Epsom towards the radio station's new portacabin. Nigel received it from bank clerks Penny Skinner (right) and Sesanne Pearce. Trevor Leonard, programme controller, in the hot seat - his regular slot is Friday evening. Radio EDH is to extend its hours "on air". So if you are interested in having fun, love music, and hard work, want a career in radio or even fancy yourself as the next Bruno Brookes or Tommy Vance, phone them. Although the station is hoping to attract a lot of interest from anyone between 25 and 45, age doesn't matter as long as you are over 18 and feel young at heart. 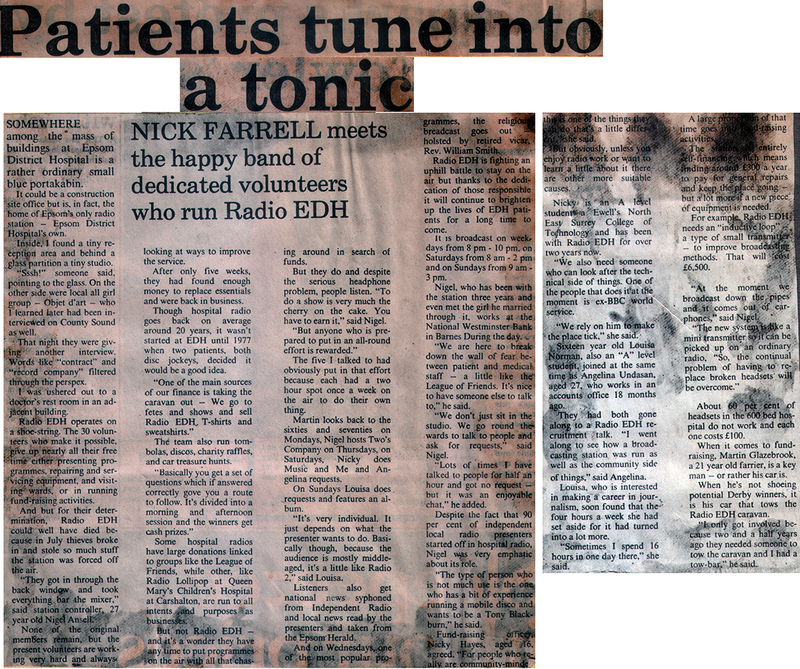 Radio EDH is based at Epsom District Hospital and has gone from strength to strength since the station was first opened 13 years by pop's Jonathan King. 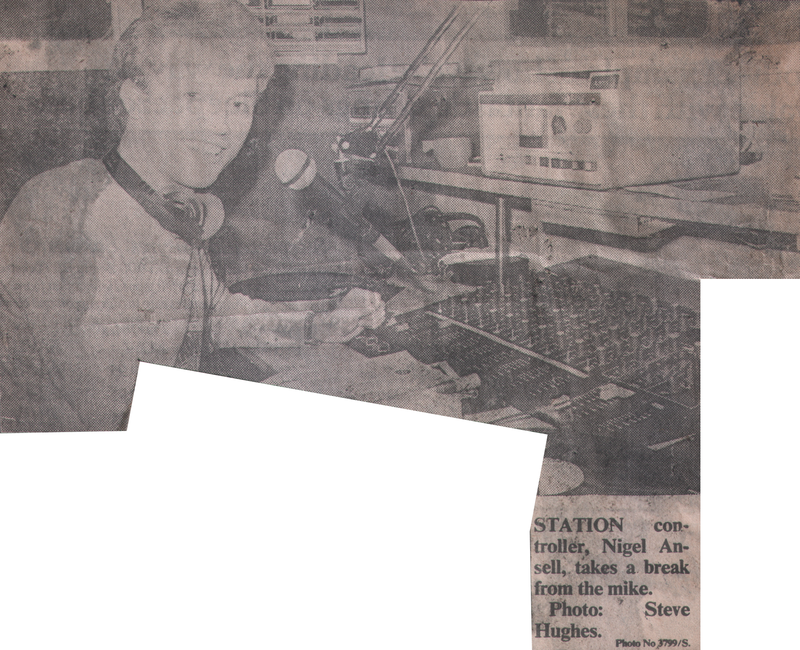 From its early beginnings in 1977 when it was little more than a garden shed perched on the roof of the hospital, it is now about to open its second studio in the radio complex. It has taken two years to raise the funds to build the new studio and a lot of blood, sweat and tears from studio engineer Andy Vaughn and his team to create a studio with some of the most up-to-date equipment on the market today. Life at the station has its ups and downs, as Andy recalled. One day he was on the roof of the hospital when some joker took away the ladder leaving him high and very wet. "As the wind whistled around me and the darkness fell I wondered whether this was really the life for me." The station broadcasts every week day from 7-11 pm and weekends from 10 in the morning to 8 at night. It provides a wide range of programming from the mad antics of Tony Cardiner to the Chart Show; from interviews with "Dire Straits" John Illsley to local news and film reviews. Radio EDH never forgets it is a service for the patients and station treasurer Trevor Leonard said: "Radio breaks down the barriers when patients first come to hospital." Dave Knott remembers the time when a letter arrived for him written in huge capital letters. He asked one of the nurses about the person who had sent it. She said: "He's been in the ward for six weeks after a stroke and this is the first thing he has been inspired to do since then." "It's positive feedback like that which makes presenting on Radio EDH so rewarding. The programmes are fun to make and interesting to listen to. Its formats are being constantly up-dated," says Jenny Miller. Funds for the station are always tight, that's the time for the fund raising team to hit the road. In the summer the EDH roadshow can be seen and heard at school fetes across the county, bringing a mixture of great music, its own brand of humour and slick D.J.ing. "It's a lot of fun and great to get out to meet everyone," said Jenny. So if you want to put your voice on air of an exciting, innovative radio station or help Andy to engineer the studio, organise an interesting range of records in the record library, or simply want to find out more about how a radio station works, phone Dave Knott on Epsom 729897. For the record - they're expanding... Radio EDH's engineer Andy Vaughan (left) and his team - Dave Knott (centre) John Litten and Jenny Miller. A lot of blood, sweat and tears have created a studio with modem equipment at the hospital. Now they'll be broadcasting more hours. A happy Nigel Ansell, (pictured left) accepts a £100 cheque from the manager of Lloyd's Bank, Ken Yale - it will help buy a second portacabin for Radio Epsom District hospital. The cabin will be used as a second studio and include an administration and reception area. So far, the radio station has raised £4,600 - their target is £5,000. Said station controller, Nigel: "We are extremely greatful' to Lloyds for their generous contribution. We hope to hit our target in the near future." The station needs a further £2,000 to £3,000 to equip the 'cabin, but aims to gradually do this in the next few years. 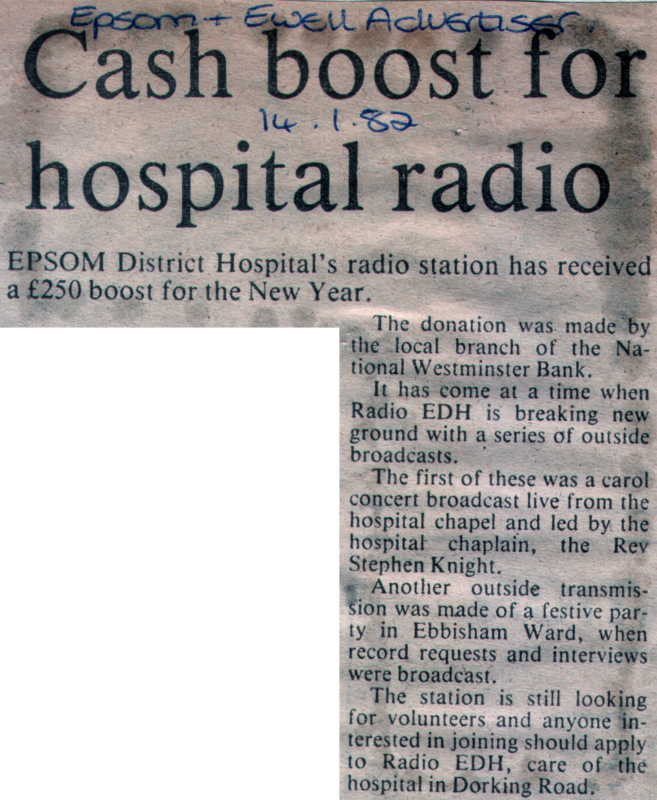 Epsom District Hospital radio station was better off by £600 this week - thank to the National Westminster Bank. 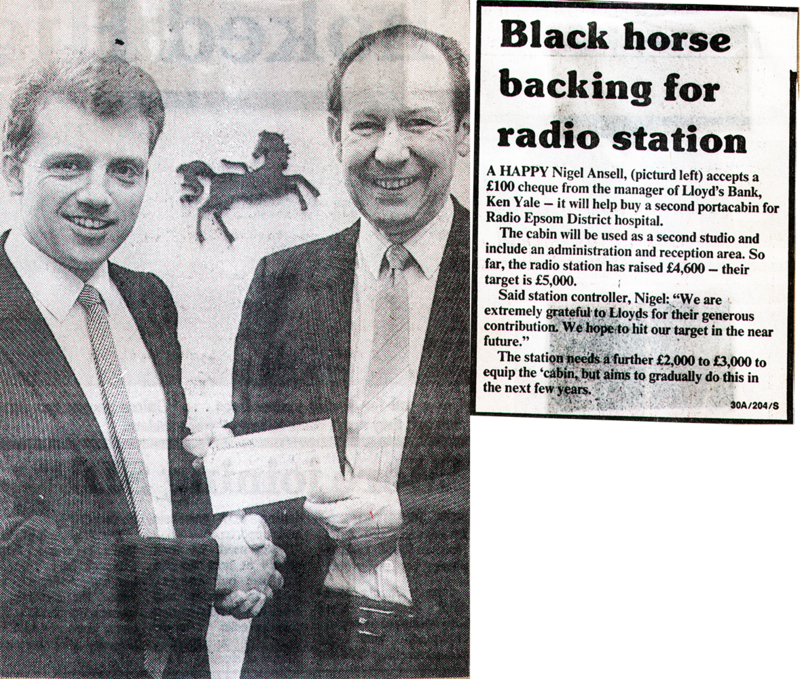 Nigel Ansell, of EDM Radio, received a cheque from the bank's Joe Baxter at a ceremony. The donation came about after Nigel wrote off to a number of local businesses and estabishments, and Natwest came up with the £500 offer. "This is very generous of them," said Nigel. "We are raising money at the moment to buy a new Portakabin to extend our premises, and this money will come in very useful." The radio station needs around £5,000 for the new Portakabin, and National Westminster's £500 brings the current total up to around £3800. "We are well on the way to reaching our target, and when we do we hope that the new extension will help us provide an improved service to patients at EDM," said Nigel. Also pictured is Fiona Curtis of Natwest. Radio Epsom District hospital will soon be broadcasting further afield... in the Falklands. The station will play requests and dedications for people in that area - especially the armed forces. Programmes will be broadcast, possibly via the military hospital. A hospital spokesman said: "We will use the tapes when appropiate." 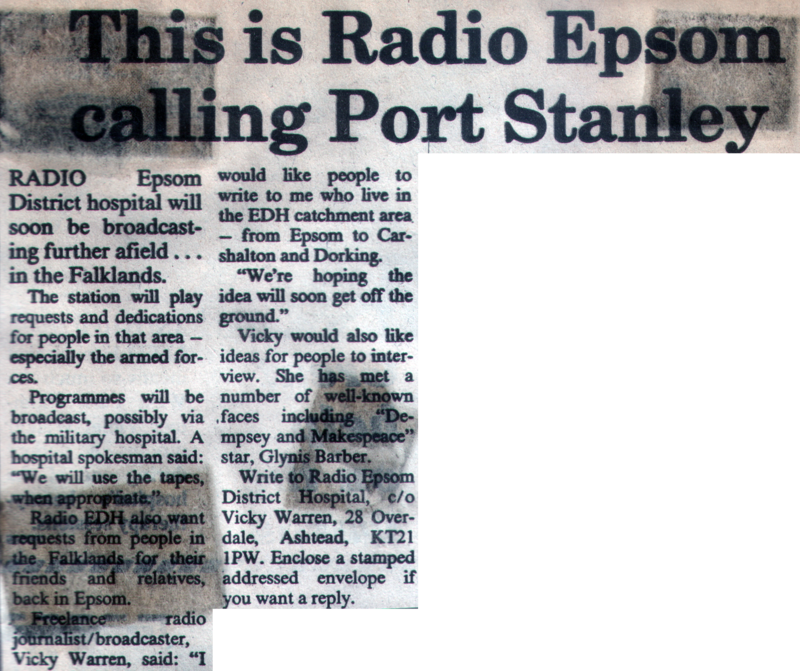 Radio EDH also want requests from people in the Falklands for their friends and relatives back in Epsom. Freelance radio journalist/broadcaster, Vicky Warren, said: "I would like people to write to me who live in the EDH catchment area - from Epsom to Carshalton and Dorking. "We're hoping the idea will soon get off the ground." Vicky would also like ideas for people to interview. She has met a number of well-known faces including "Dempsey and Makepeace" star, Glynis Barber. Write to Radio Epsom District Hospital, c/o Vicky Warren, 28 Overdale, Ashtead, KT21 1PW. Enclose a stamped addressed envelope in you want a reply. How many pairs of feet can you get aboard a fire engine! The answers in the hundreds, if you're really trying! And they enjoyed trying at West Ewell on Saturday when Riverview County First School and the 1st Ruxley Scouts group got together to blaze a trail to a fun-filled fete. As well as this big attraction there were sideshows, raffles, and pony rides for visitors to enjoy. Radio EDH supplied the afternoon's music. It's too soon to say how much was made for the school and for the scouts. "But it was an enjoyable day," said one of the organisers, Mrs Pat Carslake. A group of children from Epsom District Hospital enjoyed a day out at the movies on Sunday - thanks to the hospital radio station. Vicky Warren of Radio EDH wrote to the distributors of the new "Care Bear" film, and to her surprise received 47 tickets in return. "I really just wrote to them on the off-chance, asking if the hospital radio station could get involved in this, and was amazed when the tickets came back," she said. Armed with the tickets, Mrs Warren contacted Bookham Coaches, who agreed to donate a coach for the trip, plus a driver to show them the sights on the way to the cinema in London. 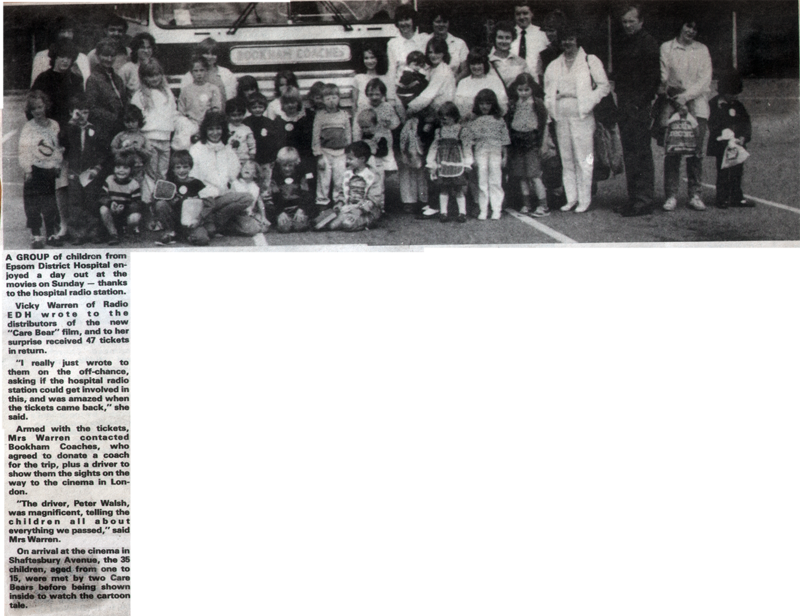 "The driver, Peter Walsh, was magnificent, telling the children all about everything we passed," said Mrs Warren. On arrival at the cinema in Shaftesbury Avenue, the 35 children, aged from one to 15, were met by two Care Bears before being shown inside to watch the cartoon tale. A disc jockey from Ashtead is taking part in what could be a record-breaking run. Because Robin Chapman (33), a staff nurse at the Manor Hospital, Epsom, has been selected to take part in the London Marathon. 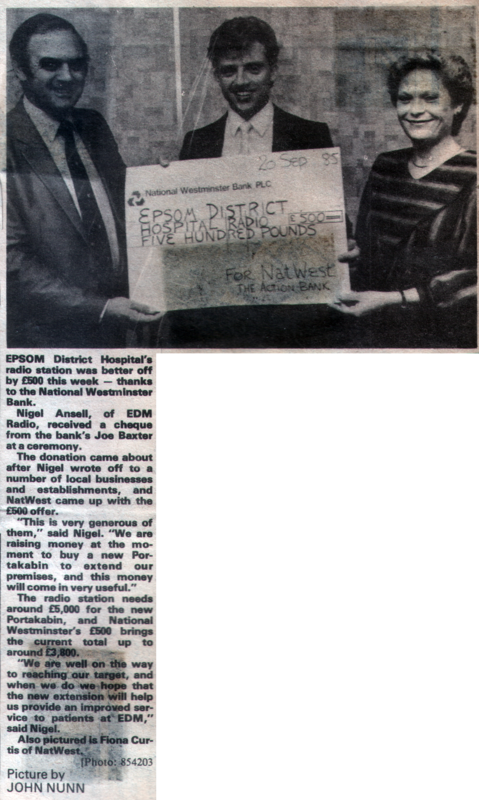 Robin has decided to hand over the proceeds of his sponsorship to Epsom District Hospital Radio station, where he has been a DJ for the past five years. The money will be in the form of a farewell gift from Robin, of Petters Road. For on Wednesday he will spin the discs for the last time, before moving to Northampton where he is to be married. Now the disc jockey is busy looking for sponsors for his money-spinning venture. Anyone who can help should contact him on Ashtead 75420. 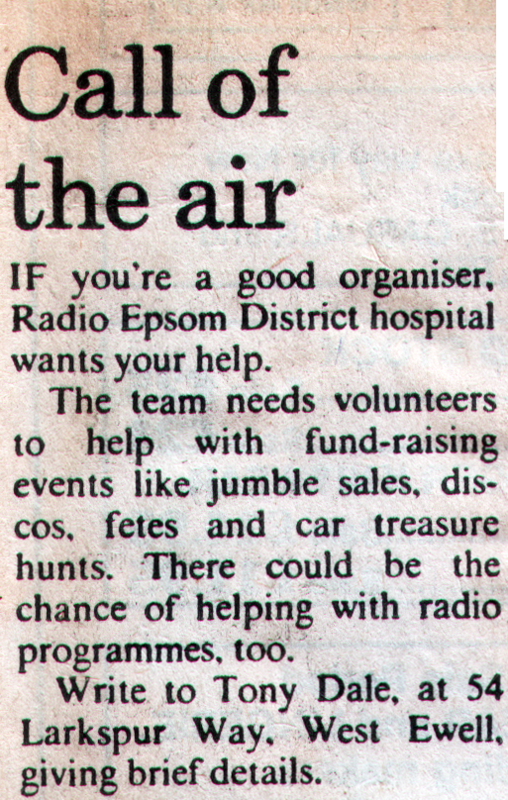 If you're a good organiser, Radio Epsom District hospital wants your help. The team needs volunteers to help with fund-raising events like, jumble sales, discos, fetes and car treasure hunts. There could be the chance of helping with radio programmes too. Write to Tony Dale. at 54 Larkspur Way, West Ewell, giving brief details. Robin Chapman, 33 a staff nurse at Epsom's Manor Hospital, has been selected to take part in this year's London Marathon. And Robin has decided to hand over the proceeds of his run to the Epsom District Hospital Radio station, where he bas been a DJ for the past five years. The money will be in the form of a farewell gift from Robin, of Petters Road, Ashtead. Yesterday (Wednesday) he spinned discs for the last time...he's moving to Northampton where he is to be married. The cash will go towards buying a new portable studio for the hospital radio. Robin, an Epsom and Ewell Harrier, has competed in half marathons before, but it will be his first attempt at the London race. Now the disc jockey is busy looking for sponsors for his money-spinning venture - anyone who can help can contact him on Ashtead 75420. Stall holders can help Epsom District Hospital Radio keep patients entertained by attending their fete next month. The station serving about 600 patients will be running its major cash raising event at The Paddocks, Epsom Downs, on Saturday July 21, beginning 2pm. 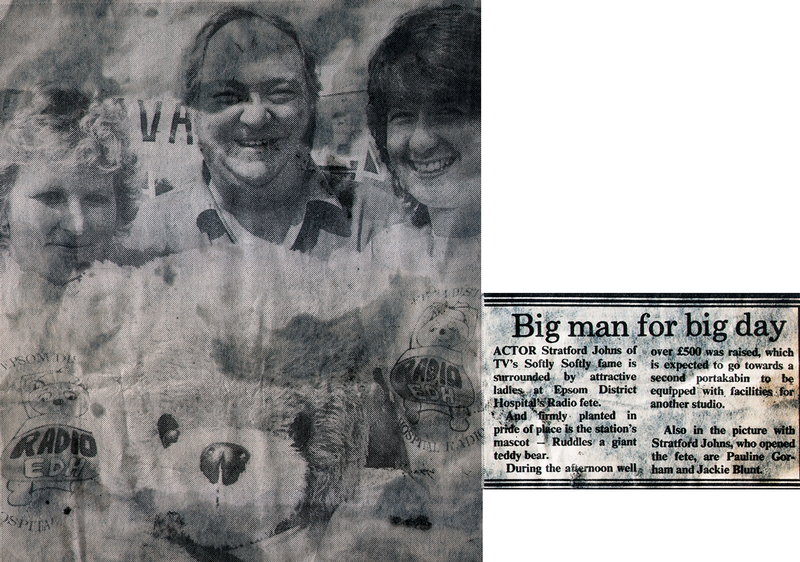 Actor Stratfotd Johns is expected to open the event ably helped by the Daily Mirror's Teddy. All enquiries to the station on Epsom 29897. Patients at an Epsom hospital get the chance to hear radio requests within minutes of asking. 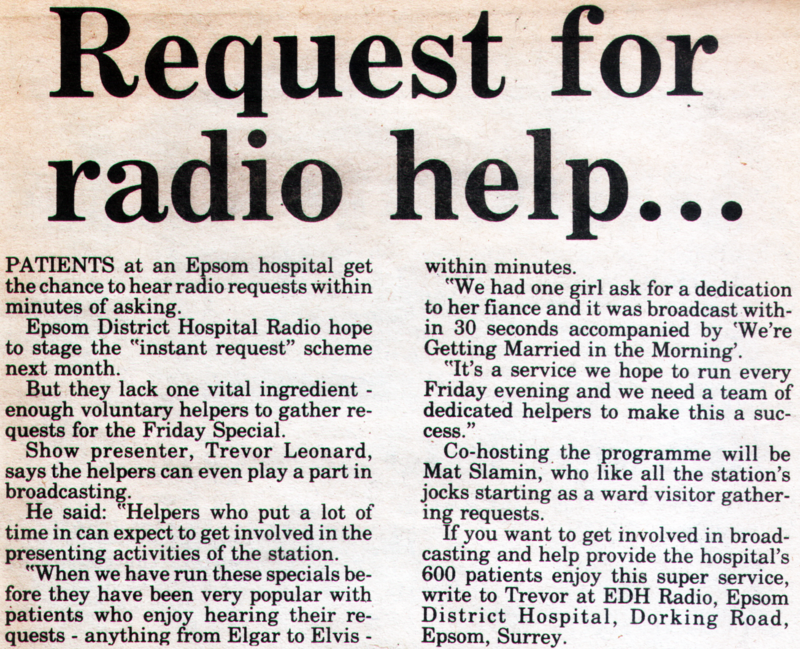 Epsom District Hospital Radio hope to stage the "instant request" scheme next month. But they lack one vital ingredient enough voluntary helpers to gather requests for the Friday Special. Show presenter, Trevor Leonard, says the helpers can even play a part in broadcasting. He said: 'Helpers who put a lot of time in can expect to get involved in the presenting activities of the station. "When we have run these specials before they have been very popular with patients who enjoy hearing their requests - anything from Elgar to Elvis - within minutes. "We had one girl ask for a dedication to her fiance and it was broadcast within 30 seconds accompanied by 'We're Getting Married in the Morning'. "It's a service we hope to run every Friday evening and we need a team of dedicated helpers to make this a success." Co-hosting. the programme will be Mat Slamin, who like all the station's jocks starting as a ward visitor gathering requests. If you want to get involved in broadcasting and help provide the hospital's 600 patients enjoy this super service, write to Trevor at EDH Radio, Epsom District Hospital, Dorking Road,Epsom, Surrey. Epsom District hospital's radio station got a big boost for its portacabin appeal with a £500 cheque from Marks and Spencer. Epsom's branch manager Edward O'Neill presented it to Nigell Ansell at the store last Wednesday. The radio station volunteers are trying to raise £3,500 to extend their facilities. They have raised £2,000 in two years and are anxious to hit their target. Said Mr Ansell: "We wrote to the manager and someone came down and seemed very impressed with what we were doing at the hospital. We are highly delighted with the gift and will be approaching some other firms." Up to and including Sunday: Normal programmes. 10 pm-1 am - Trevor Leonard. 4-6- pm - Trevor Leonard. 8-10 pm - Robin Antony and Jane Ward. To request a record for a friend or relative in Epsom District Hospital, phone Epsom 29897 during broadcasting hours. Actor Stratford Johns of TV's Softly Softly fame is surrounded by attractive ladies at Epsom District Hospital's Radio Fete. And firmly planted in pride of place is the station's mascot - Ruddles a giant teddy bear. During the afternoon well over £500 was raised, which is expected to go towards a second portakabin to be equipped with facilities for another studio. Also in the picture with Stratford Johns who opened the fete, are Pauline Gordham and Jackie Blunt. Back in blue former 'Z Cars' star, Stratford Johns helped raise £600 at the Epsom District Hospital Radio Fete on Saturday. 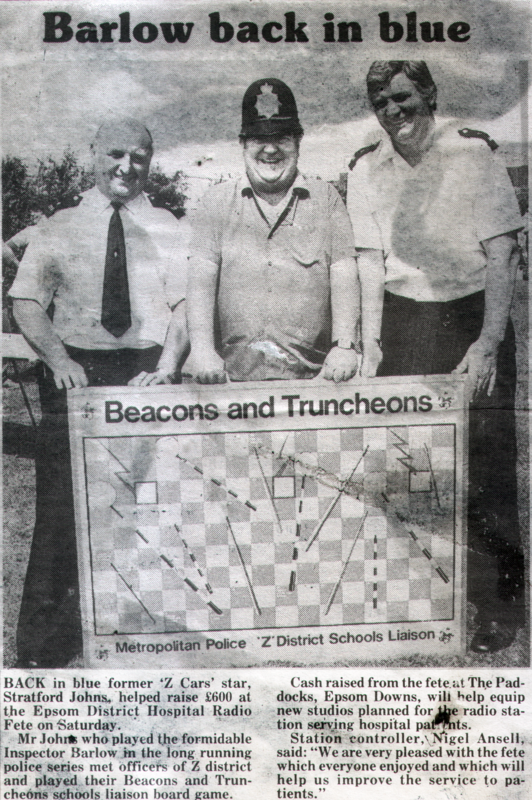 Mr Johns who played the formidable Inspector Barlow tn the long running police series met officers of Z district and played their Beacons and Truncheons schools liaison board game. Cash raised from the fete at The Paddocks, Epsom Downs, will help equip new studios planned for the radio station serving hospital patients. Station controller, Nigel Ansell, said: "We are very pleased with the fete which everyone enjoyed and which will help us improve the service to patients." Actor Stratford Johns is expected to open the event ably helped by the Daily Mirror's Teddy. Actor, Stratford Johns, will open the main fund raising fete for Epsom District Hospital Radio on Saturday. A wealth of side shows, stalls and attractions will feature amid music from the Second Hook Scout and Guide band. There'll also be a dance display by the Epsom Playhouse School of Dancing. The fete's Grand Raffle includes a Rowenta Coffee Maker for the winner and £50 of cleaning equipment for the runner up. Admission to the fete beginning from 2pm at The Paddocks, Epsom Downs, is by 20p programme which gives free entry to the raffle. All funds will help continue the station's service to 600 patients at the hospital. Piles of shiny discs may be lying in your attic collecting dust when they could be enjoyed by Epsom Hospital patients. An appeal for records has this week been launched by Epsom District Hospital Radio station. They'll take anything - LPs, 45s or even aging 78 discs to help them provide a comprehensive selection of records for the 600 patients who regularly tune in. If you can help, phone the station during broadcast hours (weekdays 8 pm to 10 pm, weekend 10 am to 8 pm) on Epsom 29897. 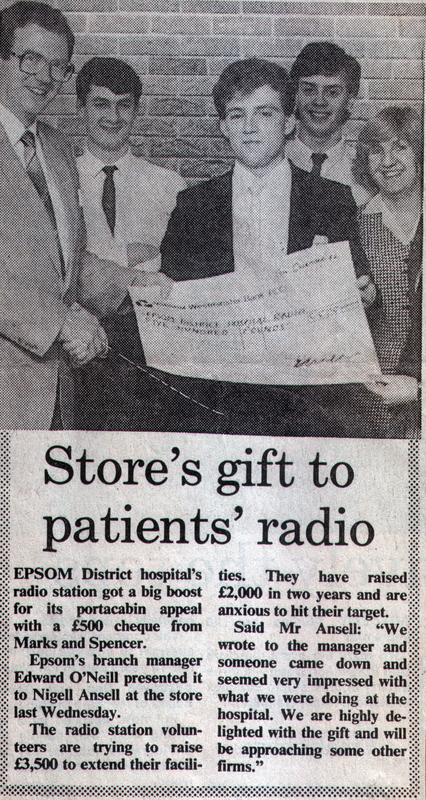 To raise £5000 is the daunting task facing members of Epsom District Hospital's radio station. They need the cash to install a new broadcasting system to reach all patients at the hospital in Dorking Road. The "loop" transmitting set up, expected to cost a total of £7,000, will replace the less efficient cable broadcasting system plagued by faults. But now the station needs volunteer fund raisers if they are to get the new system in in the near future. Recuiter Tony Dale, said: "We managed to raise £2,OOO in the last year but if we are to get the loop system we need more help." The station provides bed-bound patients with a link with the outside world, broadcasting local neWs, religious and music programmes. Volunteers may eventually get the chance to take part in broadcasting shows or patients. But Tony said: "We don't want whizz-kid DJs only interested in broadcasting. "What we need most are people willing to spend some time helping us raise cash for our new system." If you feel you could help write to Tony at 54 Larkspur Way, Ewell, with a brief profile of yourself. 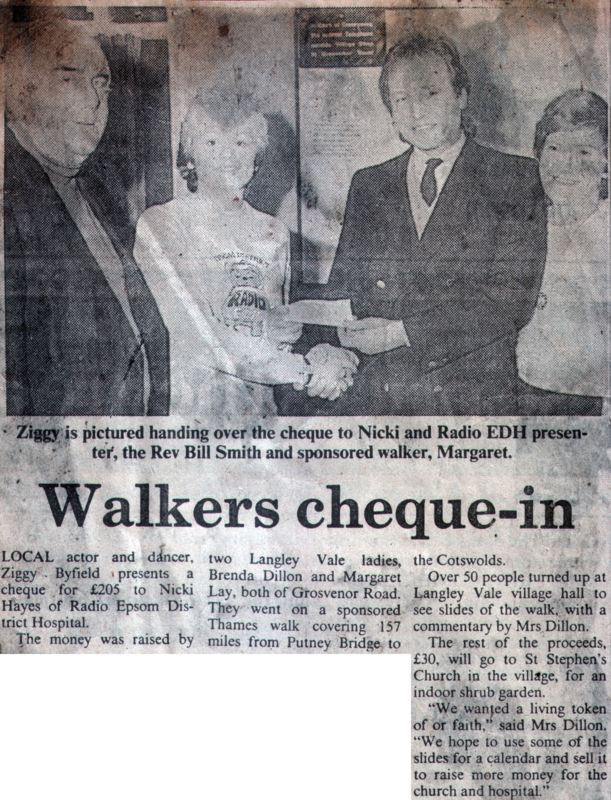 Ziggy is pictured handing over the cheque to Nicki and Radio EDH presenter, the Rev Bill Smith and sponsored walker, Margaret. Local actor and dancer, Ziggy Byfield presents a cheque for £205 to Nicki Hayes of Radio Epsom District Hospital. The money was raised by two Langley Vale ladies, Brenda Dillon and Margaret Lay, both of Grosvenor Road. They went on a sponsored Thames walk covering 157 miles from Putney Bridge to the Cotswolds. Over 50 people turned up at Langley Vale village hall to see slides of the walk, with a commentary by Mrs Dillon. The rest of the proceeds, £30, will go to St Stephen's Church in the villige, for an indoor shrub garden. "We wanted a living token of our faith," said Mrs Dillon. "We hope to use some of the slides for a calendar and sell it to raise mere money for the church and hospital." 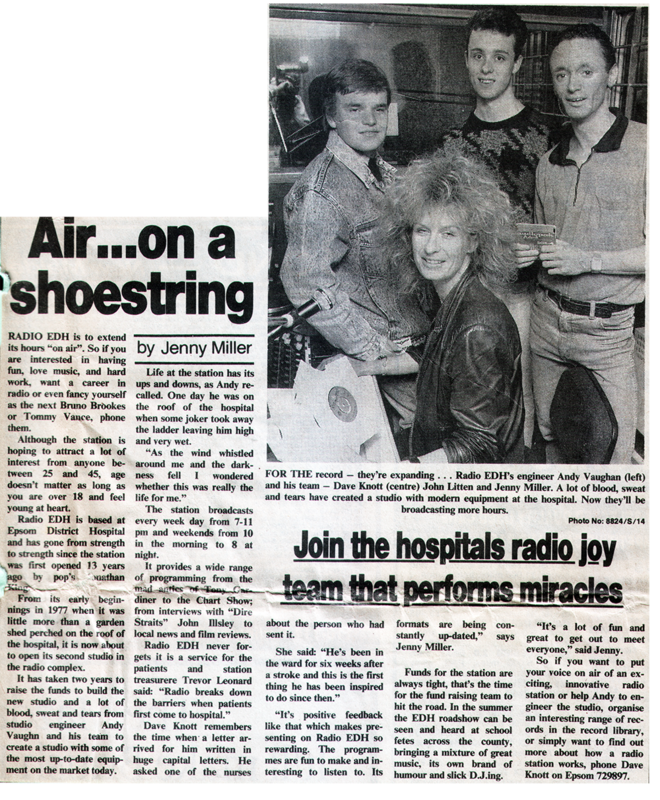 Airs of joy drifted from Epsom District Hospital. 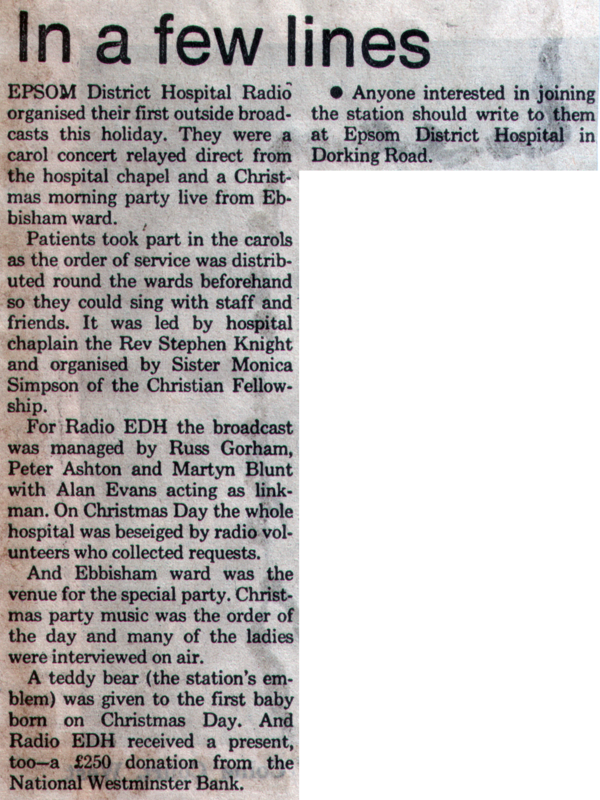 Radio E.D.H., the hospital's own radio station, made its first outside broadcasts over Christmas with a Carol concert and a party live from Ebbisham ward. The Carol Concert was broadcast direct from the hospital chapel and was led by chaplin, the Rev. Stephen Knight. Anyone interested in joining Radio E.D.H. should write to them at Epsom District Hospital, Dorking Road, marking the envelope "application". Epsom District Hospital Radio organised their first outside broadcasts this holiday. They were a carol concert relayed direct from the hospital chapel and a Christmas morning party live from Ebbisham ward. Patients took part in the carols as the order of service was distributed round the wards beforehand so they could sing with staff and friends. It was led by hospital chaplain the Rev. Stephen Knight and organised by Sister Monica Simpson of the Christian Fellowship. 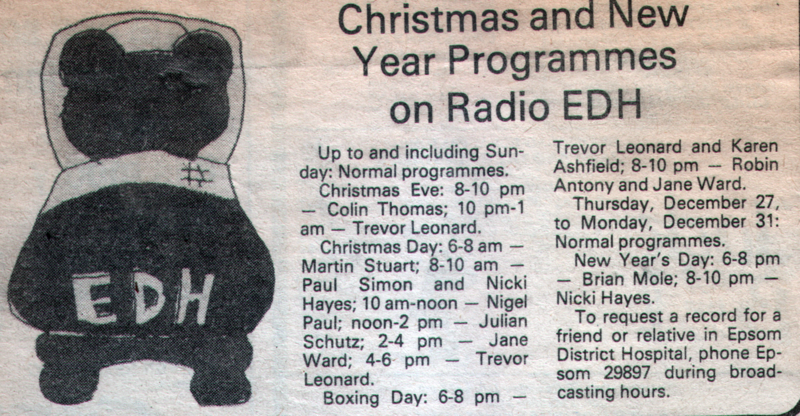 For Radio EDH the broadcast was managed by russ Gorham, Peter Ashton and Martyn Blunt with Alan Evans acting as linkman. On Christmas Day the whole hospital was beseiged by radio volunteers who collected request. And Ebbisham ward was the venue for the special party. Christmas party music was the order of the day and many of the ladies were interviewed on air. A teddy bear (the station's emblem) was given to the first baby born on Christmas Day. And Radio EDH received a present, too, a £250 donation from the National Westminster Bank. Anyone interested in joining the station should write to them at Epsom District Hospital in Dorking Road. Cash boost for hospital radio. Epsom District Hospital's radio station has received a £250 boost for the New Year. The donation was made by the local branch of the National Westminster Bank. It has come at a time when Radio EDH is breaking new ground with a series of outside broadcast. The first of these was a carol concert broadcast live from the hospital chapel and led by the hospital chaplain. the Rev Stephen Knight. 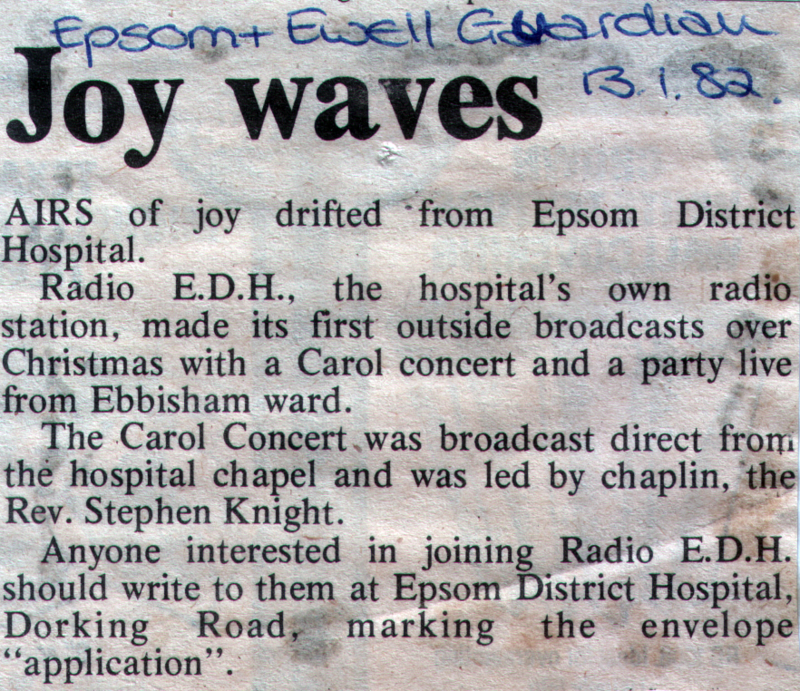 Another outside transmission was made of a festive party in Ebbisham Ward, when record requests and interviews were broadcast. The station is still looking for volunteers and anyone interested in joining should apply to Radio EDH, care of the hospital in Dorking Road. Station controller, Nigel Ansell, takes a break from the mike. They have to be fund raisers, too! Receiving you loud and clear - one patient, Mrs Winifred Williams lies back for a little easy listening, Radio EDH style. 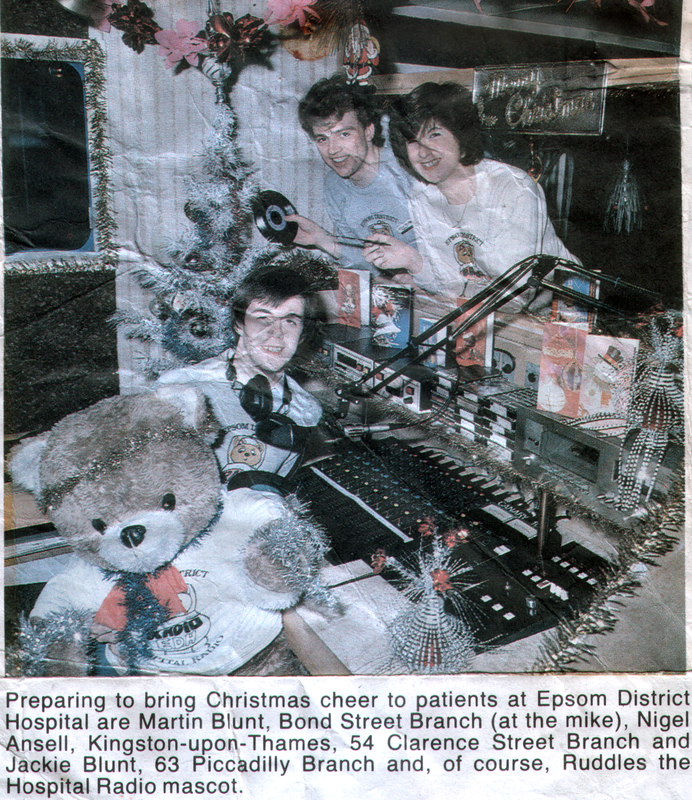 Preparing to bring Christmas cheer to patients at Epsom District Hospital are Martin Blunt, Bond Street Branch (at the mic), Nigel Ansell, Kingston-upon-Thames, 54 Clarence Street Branch and Jackie Blunt, 63 Piccadilly Branch and, of course, Ruddles the Hospital Radio mascot. Somewhere among the mass of buildings at Epsom District Hospital is a rather ordinary small blue portakabin. It could be a construction site office but is, in fact, the home of Epsom's only radio station - Epsom District Hospital's Own. Inside, I found a tiny reception area and behind a glass partition a tiny studio. "Sssh!" someone said, pointing at the glass. On the other side were local all girl group - Objet d'art - who I learned later had been interviewed on County Sound as well. That night they were giving another interview. Words like "contract" and "record company" filtered through the perspex. I was ushered out to a doctor's rest room in an adjacent building. Radio EDH operates on a shoe-string. The 30 volunteers who make it possible give up nearly all their free time either presenting programmes, repairing and servicing equipment and visiting wards, or in running fundraising activities. And but for their determination, Radio EDH could well have died because in July, theives broke in and stole so much stuff the station was forced off the air. "They got in through the back window and took everything bar the mixer," said station controller, 27 year old Nigel Ansell. None of the original members remain, but the present volunteers are working very hard as always looking at ways to improve the service. After only five weeks, they had found enough money to replace essentials and were back in business. 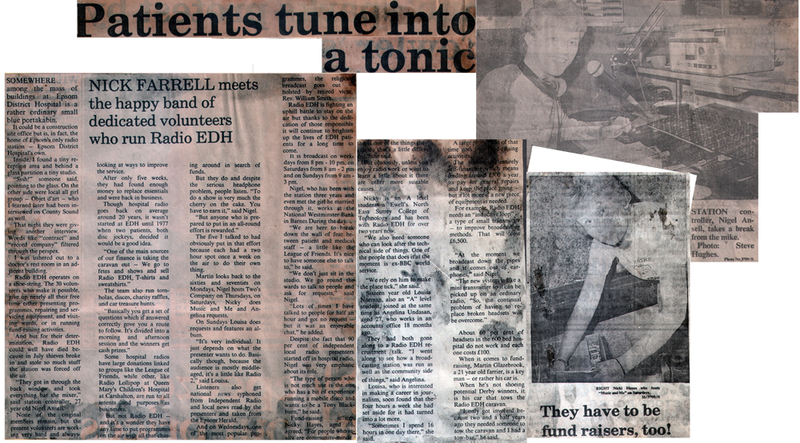 Though hospital radio goes back on average around 20 years, it wasn't started at EDH until 1977 when two patients, both disc jockeys, decided it would be a good idea. "One of the main sources of our finance is taking the caravan out - We go to fetes and shows and sell Radio EDH T-shirts and sweatshirts." The! team also run tombolas, discos, charity raffles, and car treasure hunts. "Basically you get a set of questions which if answered correctly gave you a route to follow. It's divided into a moming and afternoon session and the winners get cash prizes." Some hospital radios have large donations linked to groups like the League of Friends, while other, like Radio Lollipop at Queen Mary's Children's Hospital at Carshalton, are run to all intents purposes as businesses. But not Radio EDH - and it's a wonder they have any time to put programmes on the air with all that chasing around in search of funds. But they do and despite the serious headphone problem, people listen. "To do a show is very much the cherry on the cake. You have to earn it," said Nigel. "But anyone who is prepared to put in an all-round effort is rewarded." The five I talked to had obviously put in that effort because each had a two hour spot once a week on the air to do their own thing. Martin looks back to the sixties and seventies on Mondays, Nigel hosts Two's Company on Thursdays, on Saturdays, Nicky does Music and Me and Angelina requests. On Sundays Louisa does requests and features an album. "It's very individual. It just depends on what the presenter wants to do. Basically though, because the audience is mostly middleaged, it's a little like Radio 2," said Louisa. 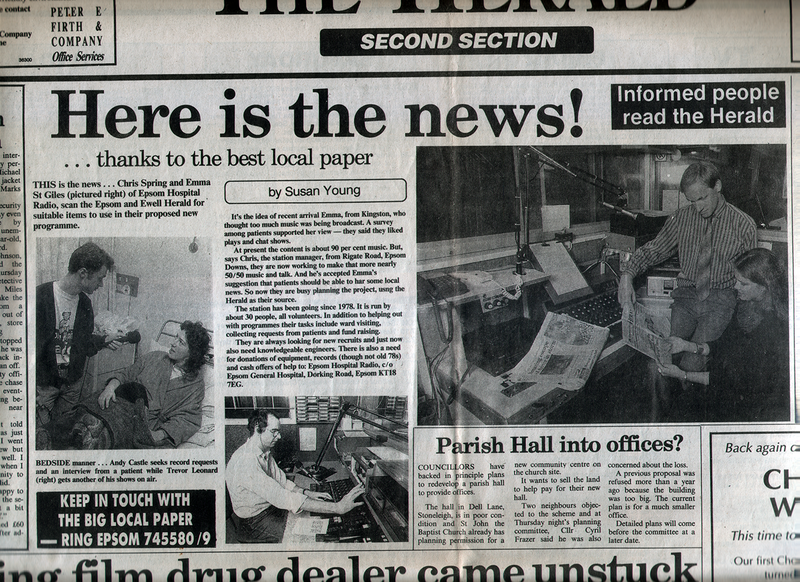 Listeners also get national news syphoned from Independent Radio and local news read by the presenters and taken from the Epsom Herald. And on Wednesdays, one of the most popular programmes, the religious breadcast goes out - holsted by retired vicar, Rev. William Smith. Radio EDH is fighting an uphill battle to stay on the air, but thanks to the dedication of those responsible it will continue to brighten up the lives of EDH patients for a long time to come. It is broadcast on weekdays from 8pm - 10pm, on Saturdays from 8am - 2pm and on Sundays from 9am - 3pm. Nigel who has been with the station three years and even met the girl he married through it, works at the National Westminster Bank in Barnes during the day. "We are here to break down the wall of fear between the patient and the medical staff - a little like the League of Friends. It's nive to have someone else to talk to" he said. "We don't just sit in the studio. We go round the wards to talk to people and ask for requests," said Nigel. "Lots of times I have talked to people for half an hour and got no request - but it was an enjoyable chat, "he added. Despite the fact that 90 percent of independent local radio presenters started off in hospital radio, Nigel was very emphatic about his role. "The type of person who is not much use is the one who has a bit of experience running a mobile disco and wants to be Tony Blackburn," he said. Fundraising officer Nicky Hayes, aged 16, agreed "For people who really are community minded, this is one of teh things they can do that's a little different," she said. But obviously, unless you enjoy radio work, or want to learn a little about it there are other more suitable causes. Nicky is an A level student at Ewell's North East Surrey College Of Technology (NESCOT) and has been with Radio EDH for over two years now. "We also need someone who can look after the technical side of things. One of the people that does it at the moment is ex-BBC World Service. "We rely on him to make this place tick," she said. Sixteen year old Louisa Norman, also an A level student, joined at the same time as Angelina Undasan, aged 27, who works in an accounts office 18 months ago. The had both gone along to a Radio EDH recruitment talk. "I went along to see how a broadcasting station was run as well as the community side of things," said Angelina. Louisa who is interested in making a career in journalism, soon found that the four hours a week she had set aside for ti soon turned into more. "Sometimes I spend 16 hours in one day there," she said. A large proportion of that time goes into fundraising activities. The station is entirely self funded which means finding £300 a year to pay for general repairs and keep the place going - but a lot more if a new piece of equipment is needed. For example, Radio EDH needs an "Inductive Loop" - a type of transmitter - to improve the broadcasting methods. That will cost £6,500. "At the moment we broadcast down the pipes and it comes out of earphones," said Nigel. "The new system in like a mini transmitter so it can be picked up on an ordinary radio. So the continual problem of having to replace broken headsets will be overcome." About 60percent of headsets in the 600 bed hospital do not work, and each one costs £100. When it comes to fundraising, Martin Glazebrook, a 21 year old farrier, is a key man - or rather his car is. ...thanks to the best local paper. This is the news... Chris Spring and Emma St Giles (pictured right) of Epsom Hospital Radio, scan the Epsom and Ewell Herald for suitable items to use in their proposed new programme. It's the idea of recent arrival Emma, from Kingston, who thought too much music was being broadcast. A survey among patients supported her view - they said they liked plays and chat shows. At present the content is about 90 per cent music. But, says Chris, the station manager, from Reigate Road, Epsom Downs, they are now working to make that more nearly 50/50 music and talk. And, he's accepted Emma's suggestion that patients should be able to hear some local news. So now they are busy planning the project, usng the Herald as their source. The station has been going since 1978. It is run by about 30 people, all volunteers. In addition to helping out with programmes their tasks include ward visiting, collecting requests from patients and fund raising. They are always Iooking for new recruits and just now also need knowledgeable engineers. There is also a need for donatlons of equipment, records (though not old 78's) and cash offers of help to: Epsom Hospital Radio, c/o Epsom Genenl Hospital, Dorking Road, Epsom KT18 7EG. Bedside manner... Andy Castle seeks record requests and an interview from a patient while Trevor Leonard (right) get another of his shows on air. Getting some tips on how the professionals do it is Epsom District Hospital Radio DJ Nigel Ansell. 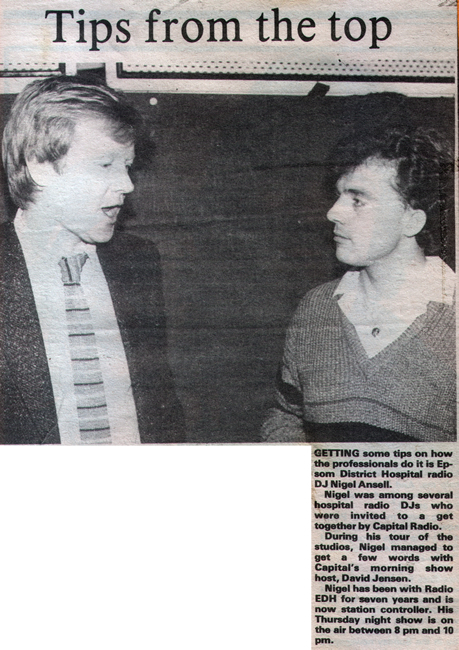 Nigel was among several hospital radio DJs who were invited to a get together by Capital Radio. During his tour of the studios, Nigel maneged to get a few words with Capital's morning show host, David Jensen. Nigel has been with Radio EDH for seven years and is now station controller. His Thursday night show is on the air between 8pm and 10pm. Nick Farrell meets the happy band of dedicated volunteers who run Radio EDH. The team also run tombolas, discos, charity raffles, and car treasure hunts. And on Wednesdays, one of the most popular programmes, the religious breadcast goes out - hosted by retired vicar, Rev. William Smith. Fundraising officer Nicky Hayes, aged 16, agreed "For people who really are community minded, this is one of the things they can do that's a little different," she said. Louisa who is interested in making a career in journalism, soon found that the four hours a week she had set aside for it soon turned into more. "I only got involved because two and a half years ago they needed someone to tow the caravan and I had a tow bar," he said. Picture Caption: Station controller, Nigel Ansell, takes a break from the mike.